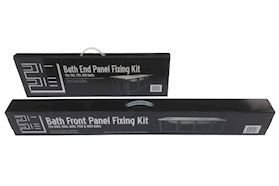 Tubfix® Bath Frame Kits - Save hours of installation! 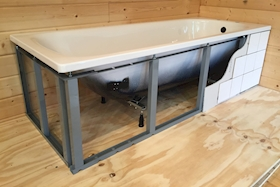 Tubfix® Bath Frame Kits - Save hours of Time and Money!!! 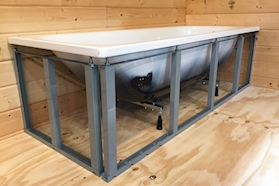 Front Frame Kit - Quick and Easy, strong and secure, eliminates the hassle of building a wooden framework. 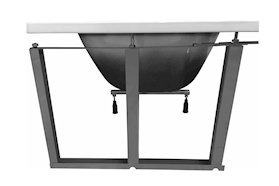 Adjusts in the height (from 470-590mm) compensates for un-level floors. 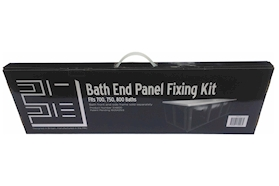 Ideal for a standard one piece bath panel (easily secured with small amount of silicone), or a tile backer board for tiling over. 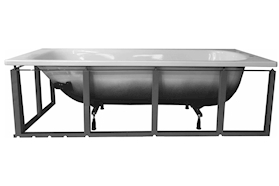 Fits baths 1400-1800mm and wall to wall up to 1930mm. If standard or stock products are ordered, they will generally be dispatched within 1-2 working days, with any personalised items taking 5-10 working days from approval. In demanding periods after promotions, regulation changes, seasonal orders, weekends back log etc... Please allow an additional 1-2 working days. 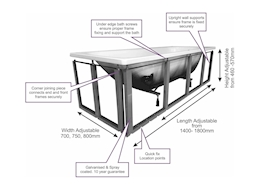 If you are desperate for your items, please advise us by emailing online@gassafetyshop.co.uk with the order number in the subject and we will try our best to meet your requirements. All personalisation regardless of product be created from the info on the Gas Safe Register, unless different requested. Any embroidery of Company name or Reg number only, will be in a standard font and in Gas Safe Yellow Thread, unless requested. 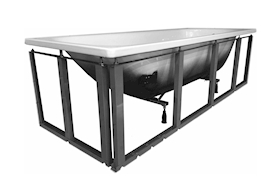 All printed products and/or Embroidered logo's will be proofed for approval before production, so non-approval may delay the delivery of all products the same order (unless split shipping has been accepted).